Joey Gallo is back in Arlington after the Rangers curiously called him up on Monday along with outfielder Jared Hoying. 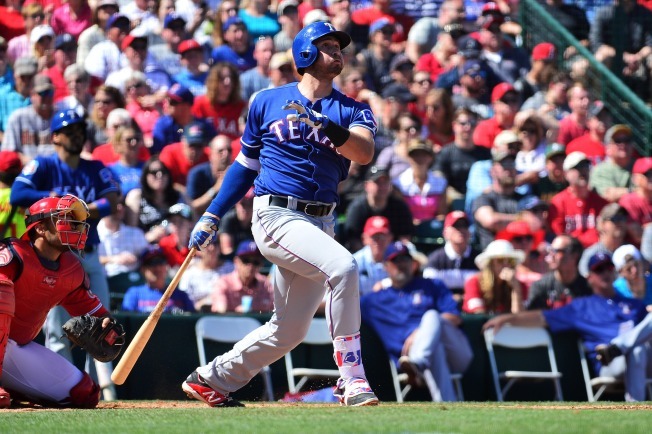 The moves were made in correspondence with two Rangers outfielders, Shin-Soo Choo and Drew Stubbs, both hitting the disabled list on Monday. Hoying's call was an expected one, and he was in the starting lineup making his big-league debut. Gallo's call was far less expected and he appeared as a pinch-hitter. So what exactly are the Rangers thinking by having Gallo up, fresh off the Triple-A disabled list, with a Rougned Odor suspension looming any day now? Well, we're not really sure. If we had to guess, we'll assume Gallo will be sent back down when Odor's suspension begins, which will likely be Friday, so the Rangers can call up Jurickson Profar to play in Odor's place. That is, unless Odor's suspension is dropped to like two or three games, which is highly unlikely. In that case, you could see Hanser Alberto as your starting second baseman for a few days. Anything more than that and the Rangers will likely want Profar up for a good week-long look. Jeff Banister's usage of Gallo on Monday night was a bit confusing, as you'd think his big bat would've been inserted sooner than it was, so it'll be interesting to see what he does on Tuesday and Wednesday before he's likely sent down again on Friday.